Marilyn Mosby, the state’s attorney for Baltimore, at her office, July 14, 2017. Though marijuana is officially against the law in Maryland, Mosby will stop prosecuting marijuana possession cases within the city limits, regardless of quantity, and seek to vacate almost 5,000 convictions, she announced on Jan. 29, 2019. BALTIMORE — Marijuana is officially against the law in Maryland, but Baltimore’s top prosecutor said Tuesday she would stop prosecuting marijuana possession cases within the city limits, regardless of quantity, and seek to vacate almost 5,000 convictions. 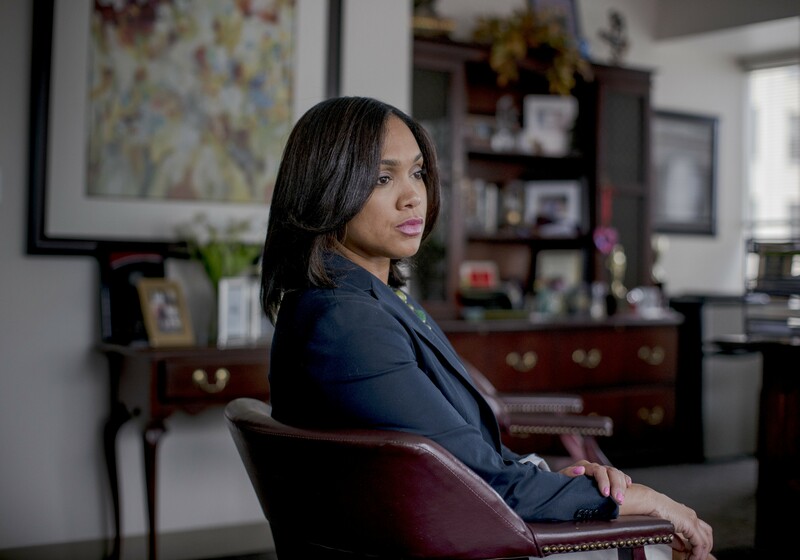 The announcement by Marilyn Mosby, state’s attorney for Baltimore, follows a nationwide trend in which big city prosecutors are de-emphasizing marijuana prosecutions. Baltimore has both the nation’s highest murder rate among big cities and one of the most broken relationships between its police and its citizenry. Its marijuana enforcement has been wildly disproportionate — more than 90 percent of the citations for low-level possession between 2015 and 2017 were issued to black residents, who make up about two-thirds of residents. So for Mosby, declining to prosecute marijuana possession cases has everything to do with making the city safer. “If you ask that mom whose son was killed where she would rather us spend our time and our attention — on solving that murder or prosecuting marijuana laws — it’s a no-brainer,” Mosby said in an interview in her office Monday. She also said that with a poor record of solving crime — only 1 in 4 homicides was solved last year — law enforcement needs to foster more goodwill. Under Mosby’s new rules, people will not be prosecuted for possessing marijuana, regardless of quantity, and will not be charged with distribution or intent to distribute just because they have a large amount in the absence of other indicators of drug dealing such as scales and baggies. Those charged with felony distribution for the first time will be automatically referred to a diversion program designed to help them enter the job market. Successful completion of the program can result in expungement of the case. The new policy would not apply in cases in which a defendant faces multiple charges, such as possession of both marijuana and a gun, Mosby said. Mosby briefed the interim police commissioner, Gary Tuggle, who told her he would not instruct officers to stop arresting people caught with marijuana, she said. After her announcement, Tuggle released a statement confirming arrests will continue “unless and until the state Legislature changes the applicable laws.” A spokesman for the mayor, Catherine Pugh, said she supports the commissioner’s position.